Morland is one of the UK’s leading producers of wood-based decorative panels. Our expertise and equipment, built up over decades, enables us to tailor make cost effective products to your specification. Working with Europe’s main laminate producers including Abet, Arpa, Egger, Formica, Polyrey and our own Morland brand. We offer a massive choice of decorative surfaces. For small orders (20 sheets or less) Birch plywood boards can be configured and ordered online in our shop which you can find here. For larger orders please contact our sales team who will be happy to provide you with a quote. 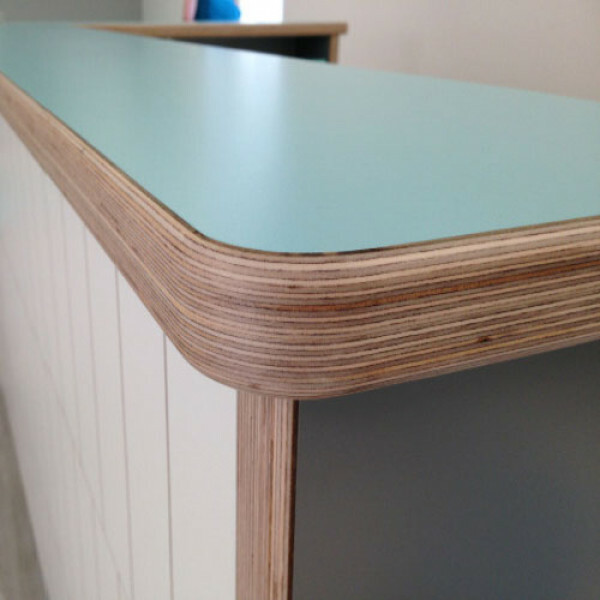 Our Birch Ply Panels use BB/BB face Grade FSC® certified Birch Plywood, producing a panel that is strong and robust with excellent screw retention properities. Additionally because of the pleasing aesthetic of this particular wood the edges can be left visible on assembly and installation, then waxed, lacquered or painted. Where weight is not a concern this material makes an excellent furniture board for vehicle fit outs. The impact resistance and durability is ideal for commercial vehicles. NEW IN! We also now offer a Formica faced birch plywood worktop at 3050x600x30mm from stock. Beautifully finished in Formica F0949 White Matte 58 this highly fashionable work surface offers a tough, scratch and impact resistant finish ideal for kitchens, utility areas and reception worktops. It's available for next day delivery and can be bought direct from us here. NEW IN! Morland's Formica Faced Birch Worktop available in store now. Morland’s laminate faced birch plywood offers a huge range of decorative laminates. The panels are extremely hard wearing so ideal for high traffic, commercial applications. Morland outline specifications are available to download below. Laminate faced birch plywood which is extremely hard wearing and suitable for high traffic, commercial applications. Birch plywood is a very dense board noted for its multiple veneer layers which improve screw retention and stability as well as providing a decorative finish by means of contouring, sanding and lacquering.